Ready for a classic story..... IN SPACE?!?!?!?! Well.... Not quite entirely in space..... But it is in space a little bit. Gankutsuou is a 24 episode Drama/Science Fiction anime loosely based on Alexandre Dumas classic novel Le Comte de Monte-Cristo. Studio Gonzo gave us the anime while Geneon originally held the rights and was released in 2006. Then in 2008, after Geneon went under, FUNimation announced they had required the license for the series and it was rereleased in 2009. It originally ran from October 2004 to March 2005, and a manga version published by Kodansha and licensed by Del Rey was released that May and is currently ongoing. The story takes place in the far future of the 51st Century, during the year 5053. While visiting Luna for the festival, Viscount Albert de Morcerf and Baron Franz d'Épinay make the acquaintance of the Count of Monte Cristo, a self-made nobleman. When they part, the Count promises to visit Albert in Paris. After he arrives, he introduces himself to the most powerful families in France (the Morcerfs, the Danglars, and the Villeforts). The general plot of Gankutsuou, while broadly the same as the novel on which it is based, changes many aspects of the source material. In the novel, the narrative arc follows the Count chronologically; in the anime, the story begins with Albert and Franz meeting the Count on Luna (which occurs, in Rome, many hundreds of pages into the book), and the Count's back story is pieced together throughout the series. The anime's plot includes supernatural elements, talking about space travel, computer systems and robots, different fates for some characters, the disposal of several side-plots, and an altogether different ending. The look of the series is certainly a unique one. It layers Photoshop textures into digital animation with backgrounds often rendered in 3D. A similar anime that uses the Photoshop texture technique is Zoku Sayonara Zetsubou Sensei. It takes a good amount of time to get used to this style, especially in the first episode because of all the bright colors that are used, but after a short while, you can’t help but marvel at the design! The animation doesn’t seem to have any major problems in it either, so Gankutsuou was created with great care in the hopes it would be well received visually, and, for me, it was. The music for the series, often uses some classical pieces of music, including: Tchaikovsky’s Manfred Symphony, the Donizetti opera Lucia di Lammermoor, and Rachmaninoff’s Piano Conerto No. 2. Not only is this series amazing visually, the story is great as well. It took two episodes and then I was really hooked. Granted, there were a few parts where the story kind of died down a bit and would become boring. However, the main plot and the execution of it is simply to die for! A lot of the events in the anime are taken from the original story, but still with many changes to make it capable of having a SciFi/Fantasy genre. Plus, the story follows Albert and his relationship with the Count of Monte Cristo and the torment he goes through as the Count is taking his revenge on the three powerful families of France. What also is different from the novel, is the being Gankutsuou himself. He is the driving force behind the Count’s revenge plot throughout the series; a demonic presence that dwells within The Count of Monte Cristo. I don’t want to give much away about the relationship between the two, but there is a way you can tell which is the Count with or without Gankutsuou. The Count in the Japanese version speaks Japanese, while Gankutsuou speaks French. Though the series is 24 episodes long, the main plot finishes at episodes 23. The final episode takes place 5 years after the events of the series. Why am I mentioning this? Because I thought the episode count was wrong and that it was 23 episodes. I just want to make sure readers know, there are 24 episodes. There are a lot of characters in the series, and you would think that development would be hard to come by; however, that’s not the case here. A lot of the major characters have development when it’s needed. Even the major adult characters Morcerf, Danglers, and Villefort have a good amount of development; the males anyway. The only adult female with development is Albert’s mother Mercedes. With the males, it mostly entails them becoming crazy or angered from being ruined by The Count. With Mercedes, it’s her mysterious connection to The Count. Honestly it’s more fun to watch The Count and the other male adults throughout the story, rather then the children. That’s probably why parts of the story were boring, cause I wasn’t watching The Count or the male adults becoming destroyed. As for Albert, he is such a whiney little idiot and it kind of drives me nuts. He won’t listen to what anyone else says and is set on what he sees right in front of him. The only person he will listen to is The Count because he has a strange admiration for him, that can sometimes become borderline obsession once in a while. While I won’t judge anyone on their personal lives, I will profane this one: Gay. I’m not going to go in depth with the Japanese and English dubs because I have only seen clips of the dub. But, based on those clips, I will say that the Japanese is superior based on the dubbing of Albert and The Count. Although Johny Yong Bosch (Bleach) and Jamieson Price (Code Geass) were decent choices for dubbing, Jun Fukuyama and Joji Nakata make it sound a lot better. Plus, I have heard the same voice from Johny Bosch in Bleach and Code Geass and..... *sigh* I keep thinking of Ichigo in all three anime. So, again, watch the Japanese version. It has better voice actors; even for whiney little Albert. 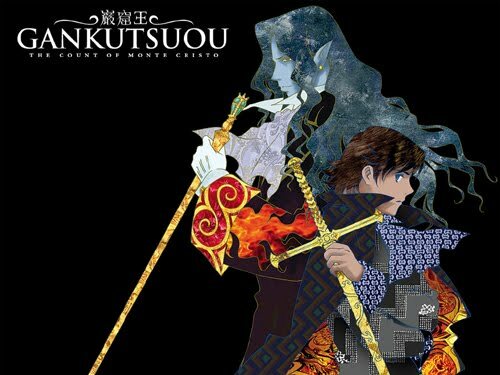 As an end result, Gankutsuou: The Count of Monte Cristo takes a classic story and gives it a modern twist, making it a visual wonder and a fun story to get hooked on. Admittedly, the visuals can be a little hard on the eyes sometimes, but if you power through it then you won’t be disappointed. I can personally say that Gankutsuou: The Count of Monte Cristo is one of my favorite anime of all time, securing a spot at my top 10, despite whiney Albert. I highly HIGHLY recommend this anime for your viewing pleasure, and hope you will be just as amazed and hooked as I was. Gankutsuou is also one of my favorites. After watching the first episode I wasn't sure if I was going to like it, but I stuck through it and eventually became hooked. I actually started to really dig the animation, mainly because of how different it was. It's one of those animes that will always stand out to me, if not only for the striking tone and visuals.